Dental implants in Downtown Los Angeles are the treatment of choice for the replacement of missing teeth. The challenge is to make the implant restorations appear like natural teeth. If you look at Figure 2, you will see that the dental implants have now healed and the pink gum tissue around the implants is circular in form. This circular tissue does not mimic the contour around a natural tooth. 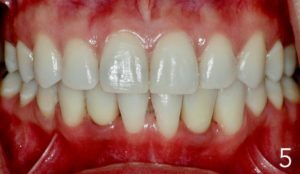 If you observe the outline of the tissue around the adjacent teeth, you will notice a more triangular outline. 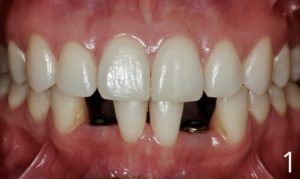 One of our techniques here at Geach Dental is to use temporary implant crowns to shape and contour the pink gum tissue so that it has a more triangular shape (see Figure 3). This step requires 2 additional weeks of treatment time, but this technique is painless and no surgical procedures are involved. 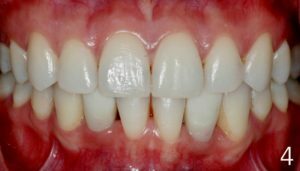 Figure 4 shows the temporary implant crowns in position. After the gum tissue is contoured, the final implant crowns are fabricated and your dentist in Downtown Los Angeles will permanently place them into the implants (see Figures 5 and 6). I think that this technique is worth the additional treatment time to carefully shape and contour the gum tissue around the implants. The goal is to make the implant restoration mimic a natural tooth so that you would not be able to notice any difference. Dr. Adam Geach earned his DMD degree from the Harvard School of Dental Medicine and his Certificate in Prosthodontics from the University of Connecticut School of Dental Medicine. As a prosthodontist, he specializes in dental esthetics, implants, and reconstructive dentistry. If you have any questions, please contact him through his website.